The Tour of Alberta, presented by ATB Financial, scheduled for September 2-7, 2015, will make stops through seven official host communities this year, with support from the Municipal District of Greenview and Parks Canada. Previously announced, the City of Grande Prairie and County of Grande Prairie will host the first two days of the 2015 event. New communities on board that will either host a start or finish are Grande Cache, Jasper, Edson, and Spruce Grove, with Edmonton back as a host for its third year. The UCI 2.1 event has the highest stage race ranking in Canada. "Our host communities are really an integral part of the success of the event," said Duane Vienneau, Executive Director of the Tour of Alberta presented by ATB Financial. "Each community is highly involved in the planning of the route and festivals. Their commitment and planning begin months before the race rolls through. Their dedication to this event is one of the many reasons why we are able to showcase Alberta internationally. We are thrilled that all of these communities have come aboard so some of the world's best mountains and most breathtaking scenery can be seen around the planet." 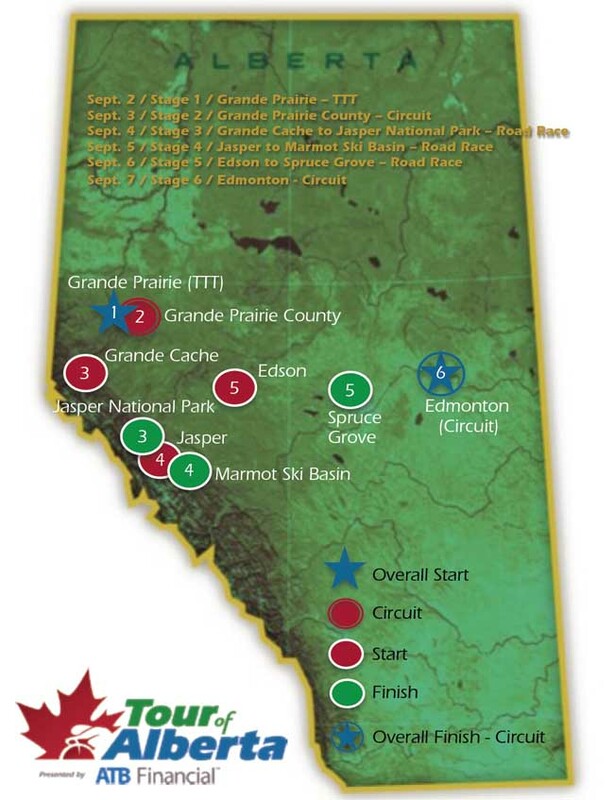 Stage 1 will kick-start the 2015 event on Wednesday, September 2nd, with a Team Time Trial (TTT) in the City of Grande Prairie. The TTT adds an exciting new element to the Tour of Alberta and will replace the Individual Time Trials of 2013 and 2014. During the TTT, all eight cyclists on each team will race together against the clock. The Team Time Trial is designed to help teams prepare for the World Championships in Richmond, Virginia, USA, two weeks after Tour of Alberta, making it big draw for top teams. The event will help both World Tour and Pro Continental trade teams a chance to tweak their training schedules. Stage 2 will race by the scenic boreal forests of the County of Grande Prairie on Thursday, September 3rd, in circuitous fashion. The race then heads west towards the Canadian Rocky Mountains during Stage 3. Starting in Grande Cache on Friday, September 4th, the race will make its way through the Municipal District of Greenview, ultimately finishing at Jasper National Park, supported by Parks Canada. It will mark the first true mountain stage in the three-year history of the event. Stage 4 on Saturday, September 5th, starts in the town of Jasper and finishes on top of Marmot Basin ski resort; it will be the first Alpine finish for the Tour of Alberta. With the support of Parks Canada, the race within Jasper National Park will be the site of the Tour of Alberta most competitive mountain stage to date. This stage will play a major factor in who wins the overall race and King of the Mountain jersey competition. On Sunday, September 6th, the race will make its way back east, beginning Stage 5 in Edson. Ultimately, the day will finish in Spruce Grove, the home town of Optum Pro Cycling p/b Kelly Benefit Strategies rider, Ryan Anderson, who holds two consecutive titles of the Tour of Alberta's Pomeroy Inn and Suites Best Canadian rider. Stage 6, the race's finale, will contested on Labour Day, Monday, September 7th, in Edmonton's downtown. Cyclists will battle to win the race or make the overall leader board. Last year's final stage saw South Africa's Darryl Impey of Team Orica GreenEDGE win the final stage, gain a 10-second bonus to win the overall race by one second over The Netherlands' Tom Dumoulin of Team Giant-Shimano. Anderson was within inches of winning the stage, which would have won him the race. "The 2015 Tour of Alberta is definitely different from the past two editions," said Anderson, who placed 5th overall in last year's race as top Canadian. "This year, we're taking a more northerly route and will hit the high mountains for the first time. The stop in Jasper National Park should be phenomenal and put a different slant on the overall outcome. We will also have a team time trial, which you don't see very often in major stage races. The final two days, with a finish in and around Edmonton, will be familiar for me, because I grew up training on many of those roads." Exact stage routes will be released in the spring. "As a province-wide event whose route changes each year, we are thrilled to bring this world-class event to so many new host communities in 2015," said Brian Jolly, Chair of the Alberta Peloton Association, "As a part of this northern route, we are able to include a true mountain stage for the first time ever. This aspect is crucial as the Tour of Alberta presented by ATB Financial continues to gain momentum in the international professional cycling community. We are already looking forward to a tour focused primarily in Southern Alberta in 2016." Planning for the 2016 Tour of Alberta presented by ATB Financial host communities will commence in the Spring of 2015. Also announced was the Tour of Alberta VIP Experience managed by Mountain Madness Tours, a unique opportunity for cycling enthusiasts to experience the 2015 Tour of Alberta presented by ATB Financial. In collaboration with Mountain Madness Tours and Travel Alberta, participants will have the opportunity to take in VIP experiences, such as riding the TTT course, driving alongside the pros in official team cars and watching the race from the best VIP hospitality areas. Additionally, participants will get to cycle through some of the 2015 host communities and other scenic areas in the Rocky Mountains. Registration for the Tour of Alberta VIP Experience managed by Mountain Madness Tours is now open. More information can be found at TourofAlberta.ca.